Pottery Avenue's Sweet little pitcher is great for warming syrup, serving salad dressing and of course gravy. Also a cute vase for wild flowers. 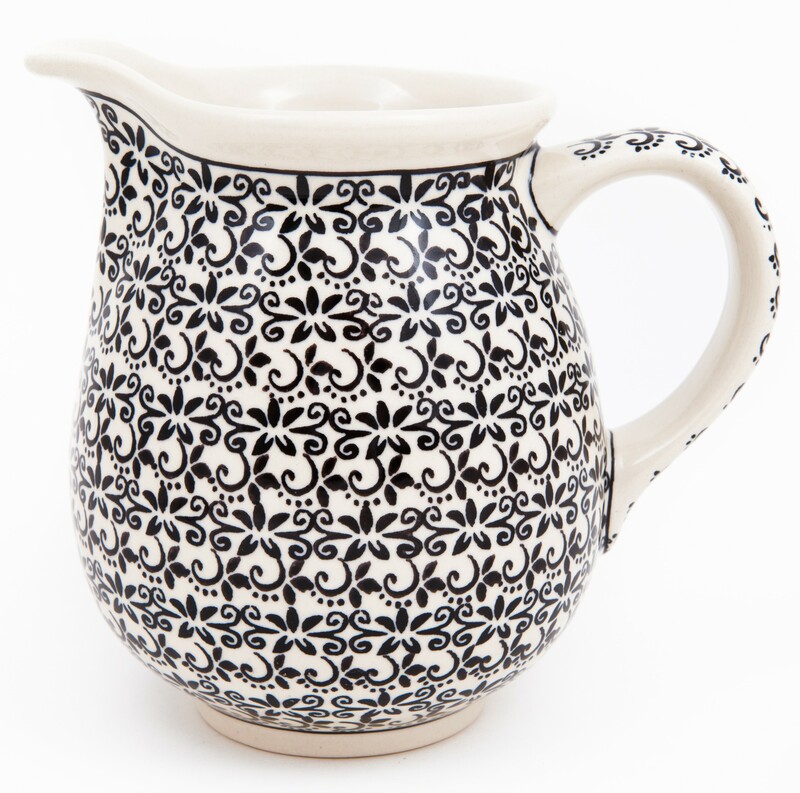 Pottery Avenue offers this Hand Painted ELEGANT TIMES Pitcher pattern with centuries old hand stamp technique, this Polish Pottery ELEGANT TIMES pattern by Z C “BOLESLAWIECE” skilled artisans, is sure to captivate you with its remarkable artistic ability. A complex Polish design and use of multiple colors mark the fact that the artisan is striving towards mastering the art. The design is applied using sponges from the Baltic sea where each motif is skillfully cut into the sponge for hand stamp application. Sweet little pitcher great for warming syrup, serving salad dressing and of course gravy. Also a cute vase for wild flowers. • Each Item is certified to bake up to 480 degrees and will make everything you cook a work of art! • Stoneware must be room temperature prior to use in a microwave or hot oven. Avoid drastic temperature swings. A national treasure, Boleslawiec ceramics have been manufactured for centuries. Developed from natural ceramic clay that can be found near Boleslawiec at the Bobr and Kwisa rivers. According to historical sources, the first stoneware was made in medieval times and in the early 16th century, local potters formed guilds to ensure perfection. Zaklady Ceramiczne "BOLESLAWIEC" was founded by one of the original men with the first pattern dating back to 1759. “ELEGANT TIMES SMALL PITCHER“ is a APPRENTICE pattern based of the 300 year old pattern "EYE OF THE PEACOCK". Designed by top designer and imported by Pottery Avenue, the premier importer of Polish Pottery & Polish Stoneware.